I don’t remember the first time I discovered Messini’s Gyros on the Danforth. It may have been a casual walk-in, or a recommendation, but I’ve been a fan of the place for 4-5 years now. 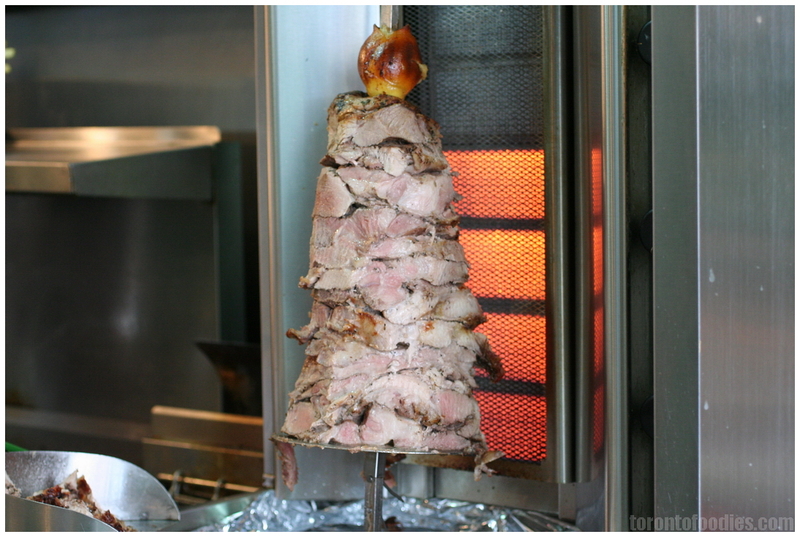 The stacks of crispy-edged meat on the spit, tangy tsaziki, the high turnover (resulting in always-fresh meat shavings), and of course, fries in the gyro. A friend hosted a summer bbq a few years ago, but was bizarrely hungry at 10pm that night. I decided to introduce him to Messini’s gyros and he was a huge fan. He’s since returned the favour, and introduced me to Folia Grill. Buzz on the internet has it that many of Messini loyalists have been sneaking to Folia, my friend included. The draw? Pork belly souvlaki and pork belly gyros. Let’s go. 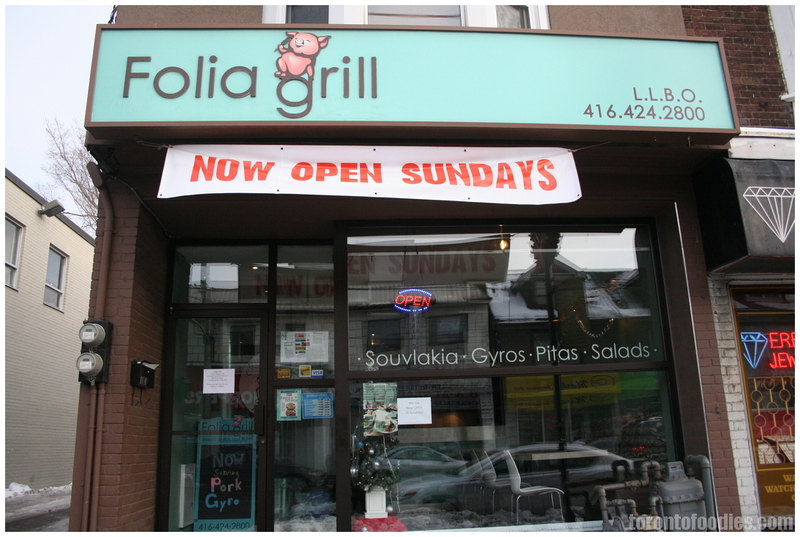 I imagine Folia Grill’s location, on Pape Ave a few blocks off Danforth, is what makes it so well-hidden. It certainly doesn’t catch the Taste of the Danforth traffic, the way that Messini does, with the longest queue of the festival every year. With the limited seating (4-5 tables), it doesn’t look like much a culinary hotspot. The interior is rather sparse, I recall seeing only 4-5 tables of 4, if that many; much of the traffic is take-out. 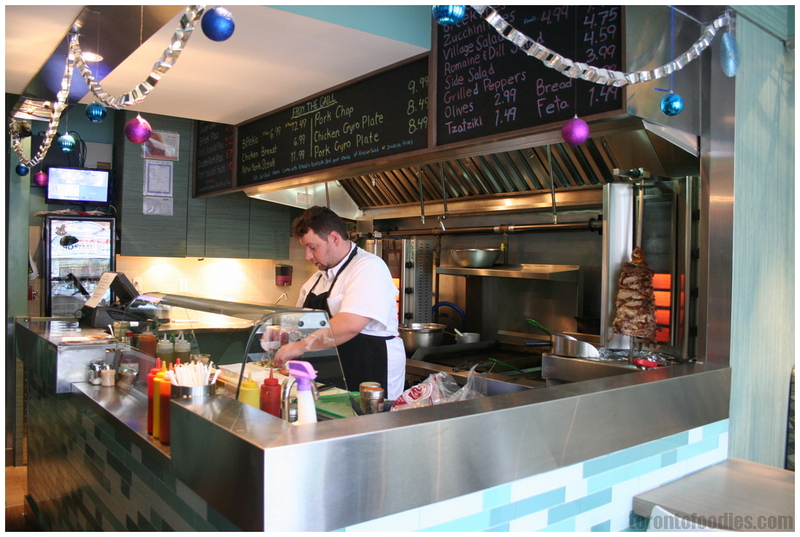 The menu board sits above the kitchen, but consists mainly of gyros, souvlaki, and a handful of side dishes. Sadly, souvlaki was not available our first visit, as their meat supplier was delinquent. Just past noon, there was ample pork spinning and roasting. We were told we may have to wait a few minutes, as we all ordered pork, and they wanted to make sure it was cooked through. A skewered lemon gently bastes the meat, although it’s likely more aesthetically pleasing than culinarily functional. I’m not sure if the pita is part of the Pork Gyro Platter, or if it simply comes with every table like a bread basket. 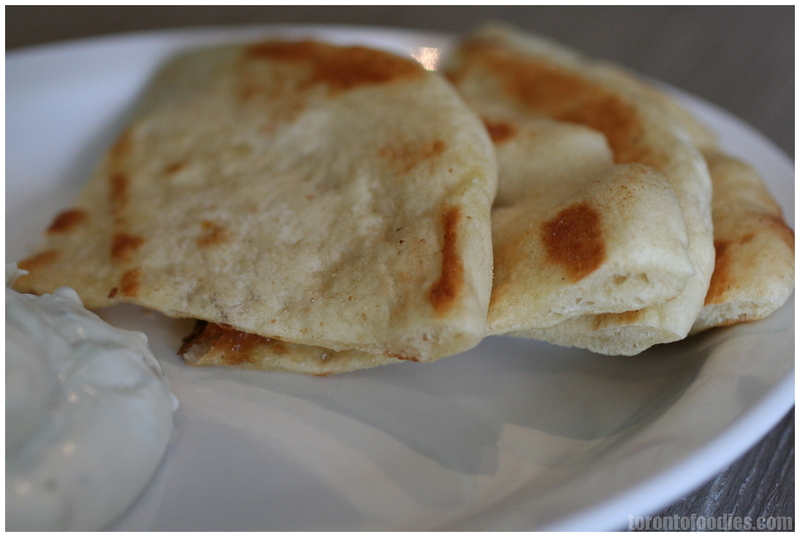 The pita is quartered, lightly olive-oiled and toasted, with a generous dollop of tzatziki. The tzatziki is refreshingly light, made with yogurt, cucumber, and maybe a tiny bit of feta? Eaten with the pita alone, it works great. When tossed into a gyro, though, it doesn’t overwhelm other flavours as much as heavier tzatzikis that have more tang & saltiness. 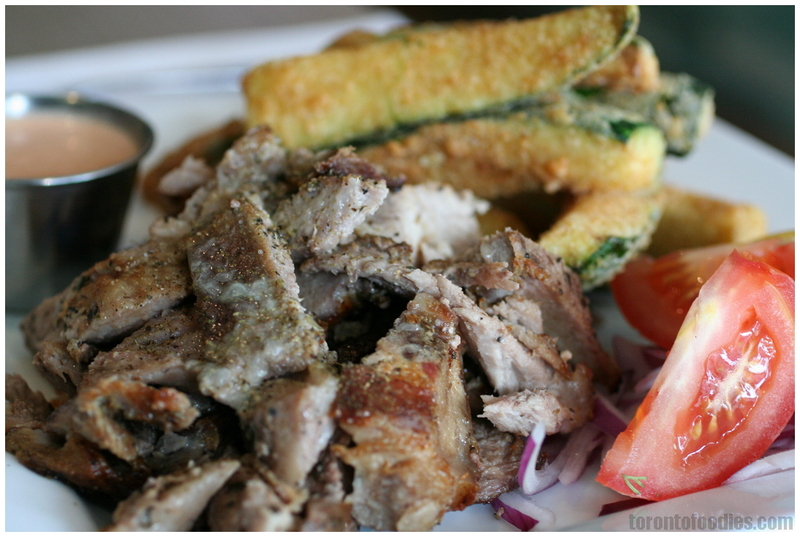 The Pork Gyro Platter ($8.95) features a half-plate of pork shavings, a choice of sides (fries, sald, etc, but you really should get the Zucchini Fries — I really really really insist), tomatoes, red onions, pitas & tsaziki. They do not skimp on volume. The pork turned out to be a tale of two visits. During our lunchtime visit, the meat was just thrown on the spit. The pork was generously seasoned with salt and oregano, while the texture still had a lot of chew and bounce. There were very few burnt or dry pieces, but did require some chewing. During an evening visit, the meat had been roasting all day, and the meat was very soft, the flavour and texture reminiscent of a cross between Chinese roast pork and well-done prime rib. The fat of the pork belly kept the meat moist & fall-apart, even though it was cooked through. I’m a bit torn as to which stage I prefer, as they both have their charms. The Zucchini Fries ($4.50 if ordered separately) were phenomenal. 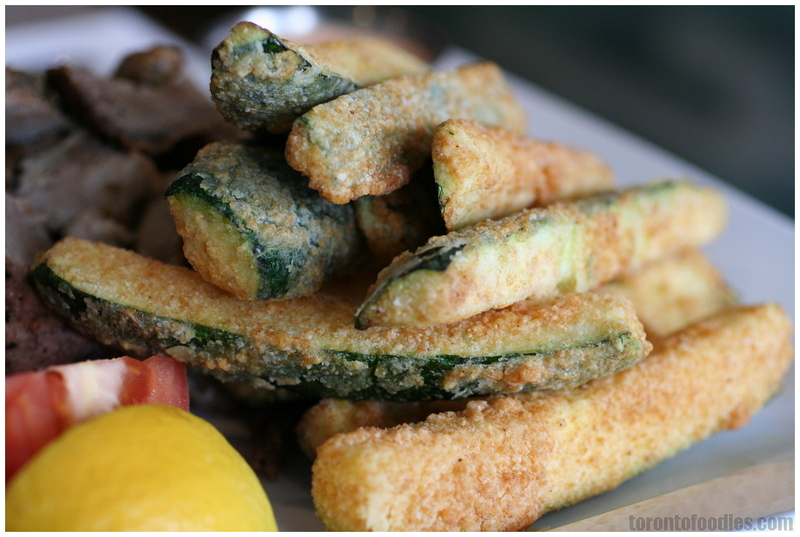 Very lightly battered, the crispy deep-fried zucchinis were cooked soft, but just firm enough to barely hold their shape. Served with a side of spicy paprika mayo, it leaves an exciting tingle with the texturally interesting (but mildly flavoured) zucchini fries. Do be careful, these are piping, roof-of-your-mouth-burning hot. It could be the psychological placebo effect of thinking veggies are healthy, but these were so perfect. 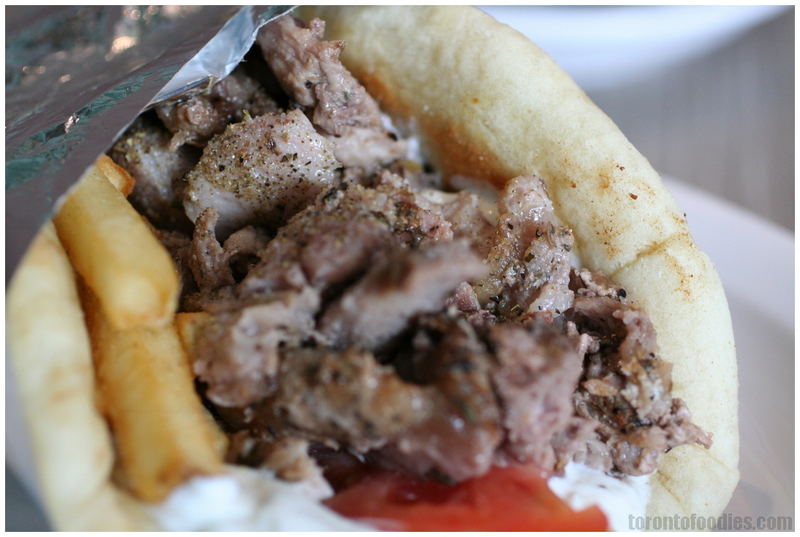 The Pork Gyro ($5.25) was stuffed with the same succulent pork, with a handful of fries, tomatoes (we passed on red onions), and a dollop of tzatziki. The meat was far more tender than Messini’s ever was, and far more flavourful. The lack of tang from the tzatziki definitely threw me off though ~ the tzatziki didn’t stand out as distinctly as Messini’s, which I always associated with gyros. On the subsequent evening visit, we had a chance to try the much-anticipated Pork Belly Skewer ($1.95). It was everything I hoped for, and more. It was very much like Japanese charbroiled pork skewers, but as entire thick cubes. The grilling leaves the meat thinly crusted with a light crunch, while imparting smokiness. 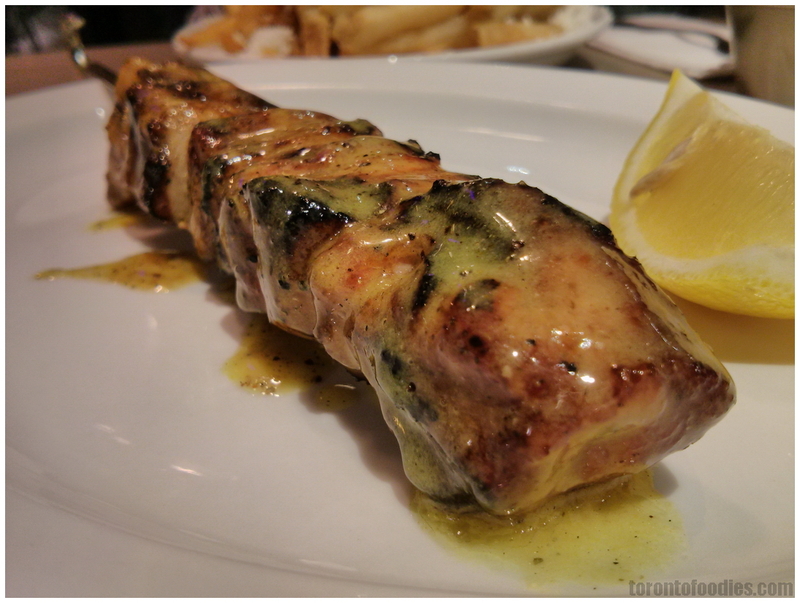 The pork has been marinated and covered with the lemon & olive oil sauce, offering a great contrast to the usual salt and oregano-dusted souvlaki skewers elsewhere. 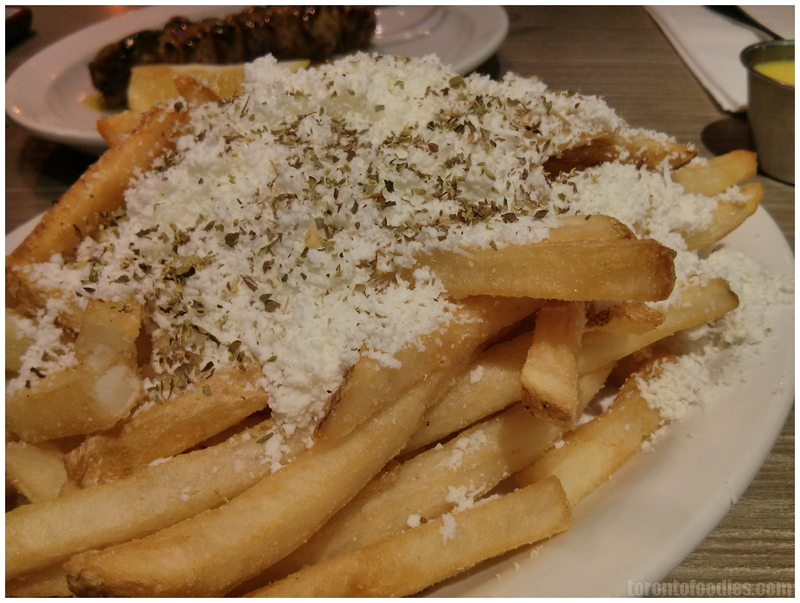 We also tried the Greek Fries ($4.50), to compare against the offering from Messini’s. Folia served straight fries, with a finer, almost powdered feta cheese, dashed with oregano. The feta had good brine and tang, while the fries were crispy and well-salted. Unlike Messini, these fries weren’t put under the same type of broiler/salamander to melt and char the cheese. As a transport mechanism for the feta, the fries were not so successful, leaving a trail of dropped feta crumbs. I think Messini’s Greek Fries are a better overall product, with their disc-shaped fries and broiled feta, but these are reasonable in a pinch. 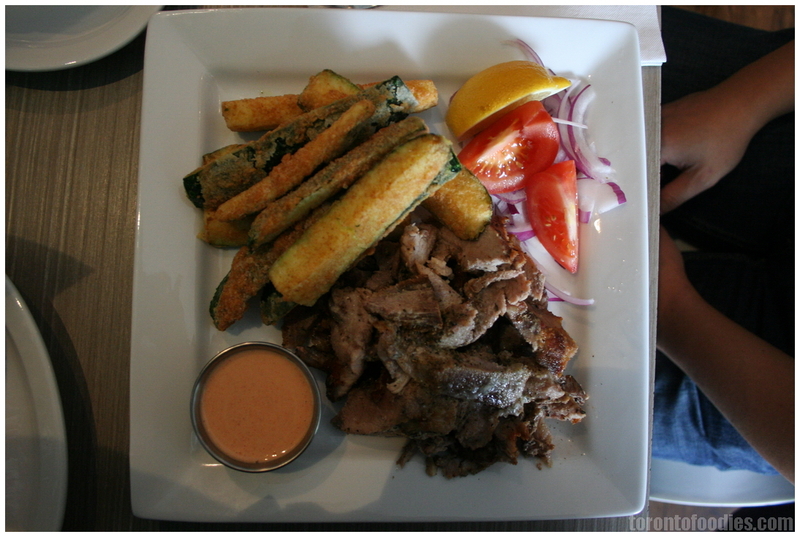 The clear winners are the Zucchini Fries and Pork Belly Souvlaki, I would make a trek here for those two items. I’m not completely sold on the overall composition of the gyro on a pita, and would probably have the pork gyro platter to savour the natural pure flavour of the meat.